Last night I watched a few minutes of an episode of the TV show “Big Bang Theory,” in which Stan Lee played himself while wearing a bathrobe that he must have stolen from Reed Richards–it had the Fantastic Four symbol on it. Silly stuff. The fanboys desperate for his autograph reminded me that I have a carton of books that Stan autographed for me when I worked at Marvel. Not comics, books. In the late 1970s, I was the special projects coordinator who was responsible for getting a spate of Marvel book projects to press. These were mostly reprint collections of various kinds, but there were also books of puzzles and games for kids, and novels. We did them in conjunction with book publishers like Simon & Schuster Fireside, their Pocket Books division, Ace Tempo, and others. We even dared to publish a paperback book on our own, eventually. 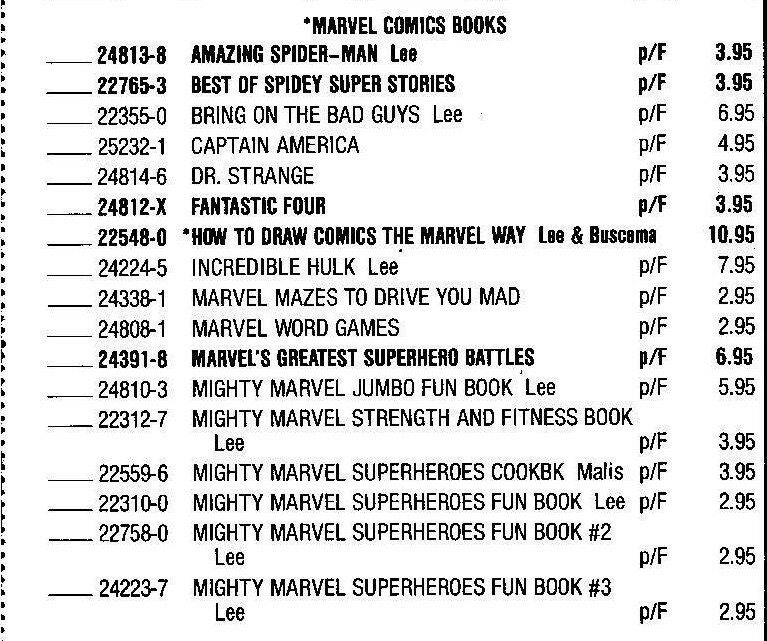 Marvel was so new at the legit publishing game that nobody believed me at first when I said we had to get an ISBN. And then there was a learning curve about bar codes, too. Oh, fun times. I had a batch of people working on these books and I liked to give everybody credits. So it was a kick nearly twenty years later when the son of a friend was reading a Marvel paperback he’d picked up from somewhere, and he found my name on the credits page. In the real world your name in print gets you points, even years later. In publishing, having your name on a book is only important if you wrote the book. But Stan Lee is an exception. Because Stan wrote most of the Marvel comics in the 1960s and let everyone know it, his name is inextricably linked to Marvel. And because he’s quite the ingratiating ham and made himself into a media darling, Stan’s name sells books. His name was plastered all over the books we produced, whether he wrote all the stories inside or not. We had plenty of photostats of his signature to use to “sign” the forewords and afterwords he wrote for the books. But he signed my books for real. How did I wind up producing those books? Although I was very excited when I first came to work at Marvel in editorial, I had found it a chaotic place. We were constantly dealing with creative people who could not get their act together and deliver work on time. Comics were shipping late, which was an aggravating waste of effort. When I left editorial to be the production manager of the reprint comics, the lack of excitement involved in reprints of Kid Colt Outlaw was more than made up for by the smoothness of the production flow. No prima donna writers, no artists who couldn’t draw a whole page, no stress. But then a few years later there I was, plunged into producing a long list of special book projects, as you can see from just these two samples of an old Simon & Schuster catalog. And Marvel was still doing things by the seat of the pants. I got handed final due dates for multiple projects and it was up to me to figure out how to get all the balls in the air, keep them in the air, and then get the final product to press on time. There wasn’t any kind of training; someone on the 9th floor cut the deal, and we on the 6th floor got handed the job. That was when I discovered that I had a knack for this sort of thing, that I could get freelancers and staffers to cooperate and produce work on time, that I could talk to our co-publishing partners and solve technical problems, and that I enjoyed the creative aspects of producing books. It was a heady couple of years, and very busy, too. Eventually, someone–maybe Johnny Romita, maybe Marie Severin–told me I should have Stan autograph all the books we produced together. I’ve never been an autograph hound, ever. But I thought, “Oh, what the heck, why not?” A lot of work went into producing those books and I was proud of them. Stan was always easy to approach and pleasant to deal with. In short order he signed a whole stack of the various titles for me. Maybe not all, but enough. And I have faithfully protected them through five moves and thirty odd years. 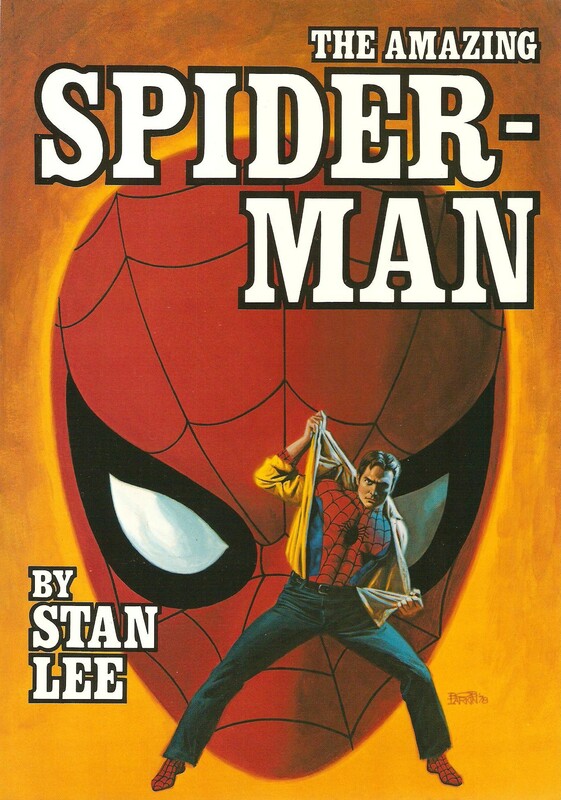 True, Stan’s name is on their covers, not my own. Sometimes my name did not make it to a credits page inside, either. Still, these are cherished souvenirs of a time when I made books happen. Today I’m in the process of making them happen by writing novels; I look forward to the day when my name will be on a book cover. Meanwhile, the frequent media references to comic book fanboys do kind of tickle me. Yeah, I was there. It was cool. And I’ve got the autographs to prove it. What a cool story! Probably a better deal than a gold watch when you leave, too.